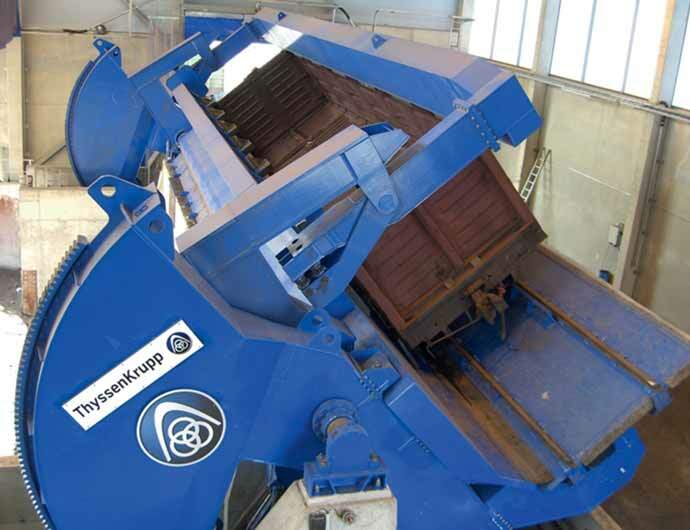 ThyssenKrupp Resource Technologies (TKRT), a division of ThyssenKrupp Industrial Solutions South Africa (Pty) Ltd, delivers end-to-end equipment solutions for bulk materials handling. TKRT roll crushers or sizers are suitable for soft to medium/hard material at high capacities. Jaw, gyratory and jaw gyratory crushers are ideal solutions for hard materials with large in-feed sizes, large reduction ratios and at medium to high capacities. “We also offer a high capacity jaw-gyratory crusher that operates on a progressive crushing principle for handling hard material and very large in-feed sizes. These crushers are similar to gyratory crushers, but with a flared inlet geometry for handling of larger lumps. Stockpiles are normally required between the mine and the port. Van der Merwe says that the selection of suitable stockyard equipment (stackers and reclaimers) is closely associated with the specific purpose of the stockpile. “Big storage, small buffer stocks and/or blending will determine the stockyard type which includes longitudinal, cone, kidney, circular, bunker, etc. Again it is best to start at the shiploading process where consideration of port storage facilities, product grades/types, reclamation rates required to load the ships and delivery requirements for material from the mine will determine preferred equipment,” he adds.